Alcohols of various forms (isopropyl alcohol, SD alcohol, cetearyl alcohol, etc) are common ingredients in skincare products including moisturizers, body washes, cleansers and toners. 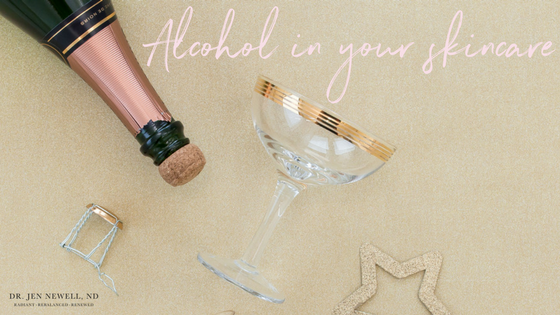 Do alcohols in your skincare damage your skin? Most alcohols in skincare are similar to rubbing alcohol but they have been combined with a denaturing agent that makes them smell and taste bad to discourage people from consuming them. Note: these denaturing agents are typically derived from petroleum. Why are alcohols used in skincare? Alcohols help mix together ingredients that aren’t normally soluble in water so that the end product is smooth and easy to apply. In products like cleansers and toners, alcohols are included to tighten the skin and reduce the appearance of the pores. Note: you cannot shrink your pores. Alcohol enhances the absorption and penetration of other ingredients into the skin. Alcohol has an antimicrobial activity within skincare products and is often used as a preservative. Alcohol evaporates quickly and is often used in products that need to be fast-drying. In general, alcohols are drying and irritating to the skin. They strip away the skin’s natural acid mantle leaving the skin dehydrated and prone to more prominent lines and wrinkles. Alcohol has been associated with an increased risk of skin irritation and contact dermatitis. The dermal barrier seals in moisture and protects the skin from environmental stressors. Alcohol damages the dermal barrier leaving the skin vulnerable to infection, allergy, and irritation by rapidly removing lipids (fat) from the skin. Many anti-acne formulations contain alcohol because of its germ-killing ability and the way it helps clear oil from the skin. Unfortunately, these benefits are only temporary. Over time, acne formulations with alcohol actually exacerbate the condition, because they cause irritation and dryness. These alcohols are used in skincare products as emulsifiers (to mix water and oil and create smooth creams and lotions), emollients (moisturizer), and thickeners (create a rich, thick consistency). While these alcohols are less drying, they can be irritating to those with sensitive skin. They may also clog the pores and contribute to the development of acne and blackheads. I encourage patients to check their skincare products for these ingredients to help their skin heal and glow with health. If your skin is prone to irritation and you have tried just about everything or you need more help finding the best skincare products for your skin, I recommend booking a visit with me so we can properly assess your skin and create a customized plan to restore your skin to health. Manuela G. Neuman, et al., “Ethanol signals for apoptosis in cultured skin cells,” Alcohol, April 2002; 26(3):179-190, http://www.sciencedirect.com/science/article/pii/S0741832902001982. Lachenmeier DW, “Safety evaluation of topical applications of ethanol on the skin and inside the oral cavity,” J Occup Med Toxicol, November 13, 2008; 3(26): http://www.ncbi.nlm.nih.gov/pubmed/19014531. Kownatzki E., “Hand hygiene and skin health,” J Hosp Infect, December 2005; 55(4):239-45, http://www.ncbi.nlm.nih.gov/pubmed/14629966. Ceilley RI, “Advances in topical delivery systems in acne: new solutions to address concentration dependent irritation and dryness,” Skinmed., February 2011; 9(1):15-21, http://www.ncbi.nlm.nih.gov/pubmed/21409958. Tosti A, et al., “Prevalence and sources of sensitization to emulsifiers: a clinical study,” Contact Dermatitis, August 1990; 23(2):68-72, http://www.ncbi.nlm.nih.gov/pubmed/2145129. Tosti, A., et al., “Contact dermatitis from fatty alcohols,” Contact Dermatitis, November 1996; 35(5):289-9, http://www.researchgate.net/publication/14201921_Contact_dermatitis_from_fatty_alcohols. An Goossens, “Contact-Allergic Reactions to Cosmetics,” Journal of Allergy, 2011, Article ID 467071, 6 pages, http://www.hindawi.com/journals/ja/2011/467071/. James E. Fulton, “Comedogenicity and irritancy of commonly used ingredients in skin care products,” J Soc Cosmet Chem., November/December 1989; 40: 321-333, http://journal.scconline.org/pdf/cc1989/cc040n06/p00321-p00333.pdf.